when carrying out door-to-door delivery/garbage collection (and then at less than 25 km/h). You must not allow any passenger in a vehicle you are driving to have any part of his or her body outside the vehicle. This rule does not include motorcycle riders and their passengers. You must not allow any person to ride on the roof or bonnet of your vehicle, or any other external part of the vehicle. For example, if you are driving a 4WD vehicle, you must not allow any person to ride on the side or rear steps, or the roof rack ladder. You must not drive with a person or people in or on a part of a vehicle primarily designed for the carriage of goods. This means passengers cannot travel in the back of a utility or panel van. An arrester bed is an area made of a special material designed to stop runaway vehicles. A driver must not drive in an arrester bed unless in the interests of road safety. You must not drive with a person or people in or on a trailer, including a caravan. You must not cause a hazard, nor must your passengers cause a hazard, to any other road user by opening a vehicle door or leaving it open. You and your passengers must not endanger others when getting out of or off of your vehicle. You (and your passengers) must keep your whole body within a vehicle, and must not travel on the outside of a vehicle, in a utility or trailer, or in a caravan. You must not get on or off (or into or out of) a moving vehicle unless you are engaged in door-to-door delivery or collection, such as milk delivery or garbage collection, and the vehicle is not travelling at more than 5 km/h. You must not drive a vehicle that has a television receiver or visual display unit (such as a DVD player) that is in operation and visible to the driver or the driver of another vehicle. This does not apply to driver's aids such as navigational equipment. You must not drive on the road, a vehicle that does not comply with the roadworthiness requirements of the Road Traffic Act 1961. If your vehicle is defective, you may be stopped at any time by a police officer and issued with a defect notice that will require you to have certain repairs undertaken. Department for Transport, Energy and Infrastructure inspectors also have the power to stop and inspect a vehicle for roadworthiness. Defect notices can instruct an owner or driver - until repairs have been made and approved - not to drive the vehicle on the road or not to sell or dispose of the vehicle. You must not start or drive a vehicle in a way that makes unnecessary noise or smoke. For example, causing the wheels of a vehicle to spin and lose traction may make unnecessary noise or smoke. It is also an offence for your vehicle to emit visible emissions for more than 10 seconds. This does not apply to emissions visible only because of heat or the condensation of water vapour. You must obey directions given by a Police officer or another authorised person. At ferries, you must obey directions given by the ferry officer. If traffic is being controlled by a Police officer or another authorised person, the directions must be obeyed in preference to traffic signals or signs. If traffic is being controlled at a road works site by traffic lights or hand-held Stop-Go signs, you must obey the directions given. It is an offence to drive a vehicle if the vehicle, or trailer being towed by the vehicle, has a device for preventing the effective use of a speed measuring device, or a device for detecting the use of a speed measuring device. If you cause any damage to a road surface, bridge or traffic control device, you are required, as soon as practicable, to advise the police or the Department for Transport, Energy and Infrastructure. South Australia is currently extending its tramway and trams are now a major part of the metropolitan road network. 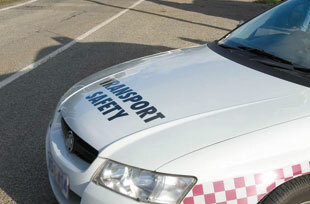 Drivers and pedestrians need to be aware of the road rules associated with trams so everyone can share the road safely. Drivers should always take extra care when driving near trams and be on the lookout for pedestrians who cross the road to catch a tram without looking. Remember pedestrians can run out onto the road to catch a tram without looking, so take extra care and look out for them. Unless they are part of an off-road tramway where vehicles are not permitted, tram tracks are positioned in the middle of the road in specially marked tram lanes. Unless specifically allowed, drivers must not drive in tram lanes. 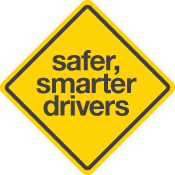 Drivers must not drive past or overtake a tram to the right, unless allowed to do so by a traffic sign or road marking. Additionally drivers must not drive past or overtake a tram to the left if the tram is turning left, or signalling to turn left, unless the driver is also turning left and there is no danger of a collision. A tram safety zone is an area of a road that is indicated by safety zone signs at a tram stop and by a structure on the road such as a dividing strip or traffic island. When driving past a tram safety zone a driver must drive to the left of the safety zone at a speed that would not endanger any pedestrian crossing the road. 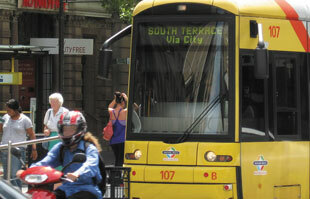 If a tram stops on a road without a safety zone, dividing strip or traffic island a driver driving behind a tram must give way to any pedestrian crossing the road between the tram and the footpath. If there are no pedestrians crossing the road a driver may drive past a stationary tram where there is no safety zone, dividing strip or traffic island at a speed not exceeding 10 kilometres per hour.